If you are looking for a starter electric guitar for a girl between the ages of 6 to around 10 a good place to start is with Daisy Rock Guitars. They have some short scale (smaller) small necked, light weight instruments that are suitable for kids in this age range. Usually I wouldn’t say girls need their own brand or models, but daisy Rock very unapologetically makes guitars that they market to girls and women, so there isn’t much point in ignoring this niche market. Some things about the idea of making an instrument for a girl really bothers me, but something like 90% of guitar players are male, so maybe there is something to be said for a guitar made to appeal to females. Daisy Rock also puts a lot of effort into encouraging girls to play through some of the events and promotions that they sponsor, which is a good thing. Daisy Rock is an interesting company; it was started in 2000 by Tish Ciravolo who was able to see that women are an underserved market in the guitar world and decided to do something about it. I think the company is currently co-owned by Alfred Music Publishing. Some of the artists that own or are associated with Daisy Rock are Avril Lavigne, Lisa Loeb, Miley Cyrus, Courtney Love and Vicki Peterson of the Bangles. One model that Daisy Rock developed is the Daisy Rock Debutante Butterfly Short Scale Fantasy Electric Pack. This particular guitar comes as a starter package that includes pretty much everything your child will need to start playing right away. With this package, you get a gig bag, electronic tuner, a strap, picks, string winder, and polishing cloth. You also get a 10-watt amplifier and a cable as well as Alfred Music Publishing’s Girl’s Method instructional DVD. Oh, and of course you get the guitar. Well, it looks like a butterfly, so obviously not any type of standard shape. It’s is very colorful and looks nice, the headstock is kind of different because it is shaped like a tear. The butterfly is short scale, so it is around 22 1/2″, which you can consider to be a short-scale along the lines of the Mini Strat or Ibanez Mikro. This instrument is a decent starter guitar for a girl who wants something that looks good and that plays okay. Some players may find the shape to be a bit awkward to play at first. If you like the look of the Butterfly you will probably also want to check out Daisy Rock’s other short scale guitars: The Ladybug, The Star, The Daisy, The Heartbreaker, The Comet are some of DR’s other uniquely shaped short scale models. The Butterfly is pretty light weight at only 5lbs, so that is a big plus for smaller kids who will have trouble playing a heavy instrument. The neck is very thin, so if you have a child with small hands, they will find the smaller neck easier to play. The butterfly shape is a little awkward some kids might find if uncomfortable to hold and play because of the shape. The action on the strings is good and easy for kids to press down. The sound is decent for the price. It is easy to tune although it does go out of tune a little quicker than I would expect although that might be because the Butterfly is short-scale so it is hard to avoid. The amp isn’t the greatest, and that affects the sound quality, so you may want to switch the amp out for something better. The Butterfly has a single humbucker pickup which some might argue limits the range of tone, although this generally isn’t a big issue for a beginner. I was a little surprised at the quality of the tuners on the Butterfly; they are pretty decent which isn’t always the case for budget models. For some reason on lower end guitars manufacturers put on terrible tuners, I’m not sure why but good job Daisy Rock for not doing this. Even though the Butterfly kind of looks like a toy the quality is good. I’ve seen other Daisy Rock guitars that to my eye don’t look as well made but this particular model is very solid. As with a lot of short scale guitars the tuning can be a bit tricky to get right and to stay in tune. The Butterfly appears to be okay for staying in tune, but be aware it is an issue with a lot of short scales models. 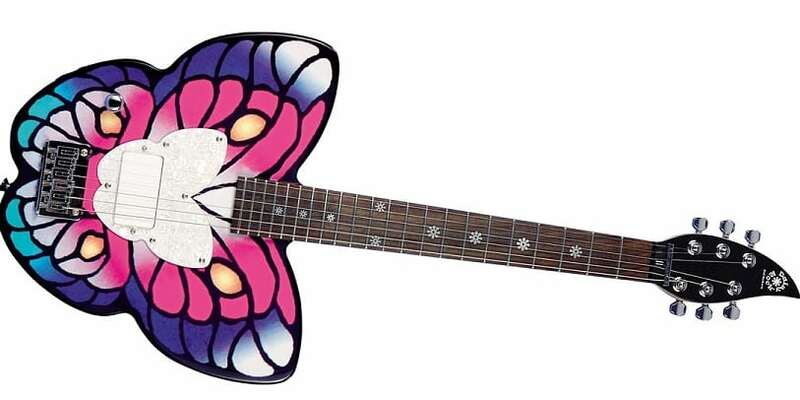 I’m kind of two minds about the Butterfly, on the one hand, I think it is very aesthetically appealing for some types of kids, but on the other hand, it looks too much like a toy guitar to take it very seriously. Although for the right kid it could be a great beginner instrument to help get kids interested in learning to play. This package is pretty good value. Overall, the amp is a little questionable but is a 6-year-old going to be super picky about sound? Probably not. The tuner and instructional DVD are a nice touch as is the gig bag, which is a good thing it is included since it might be pretty hard to find a bag that would fit this shape. If you have a little girl who isn’t super interested in the Mini Strat or the Ibanez Mikro, then this is a strong alternative.